I like a good ellipsis . . . but perhaps a 167 of them in a work that is (so far) sixteen thousand words long is a bit much . . .
And then there’s commas, 759. Double paragraphs for blank line. 36. Without these little nuisances all our beautiful words would just run together into an unintelligible wall of words. We need breaks, but where do you put them? The point of all this nonsense is to improve readability. The most carefully crafted sentence in the history of writing, that says exactly what you mean it to say, is helpless roadkill as the fast reader flashes past it . . . screeches to a halt and goes back and carefully parses out the actual meaning of the beautiful sentence. Then (hopefully) re-immerses in the story, relieved that her first take on the sentence was completely backwards. Breaking up long sentences into a few easier to chew bits can aid reader comprehension. Darn it! Beware the Great Wall of Words! Breaking up large paragraphs is also a good idea. Fast readers tend to grab the first and last sentences as they blow through. Commas can make a big difference. And drive your copyeditors crazy (pity mine!) trying to get you to put them in right places, and not put them in the wrong ones. Setting off sentence fragments with Em dashes, parentheses, ellipses and so forth can clarify meanings, jog the reader’s memory without breaking the immersion. Ellipses can also evoke a feeling of being in the character’s head as he pauses to think . . . to realize . . . and his thoughts jump ahead to an important conclusion. In dialog you can introduce natural pauses in the flow of speech, and it rarely hurts to break up dialog with some stage setting or a physical reaction inside a speech to let the reader know how the character is thinking and feeling while speaking. Just don’t do so much that it breaks up the flow of dialog. But the various ways to break things up can not just make a story more readable, they can contribute to the emotional impact of the whole passage. This is not to say that you should write in simple sentences. But don’t be obscure, and don’t make your reader’s eyes glaze over as they try to dig through a wall of text. But play around with various things. How does it look? Does it give your character an appearance of hesitation, uncertainty, or decisiveness? And was that what you wanted the reader to get from it? And how about pacing? Does it slow it down or speed it up? And was that what you wanted? This is an example where I was attempting to imply that things were happening, and still ongoing when the next thing started happening. I’ll sleep on it, run it by the Beta Readers, see what they say. It may well join a pile of stylistic, pretentious nonsense in my mental round file. But if you don’t try, you won’t succeed. Check something of your own (my early stories are scary!) and see what you can do to them breaking up long paragraphs, sentences, runs of dialog. Be not afraid! Experiment. Let it flow. Actually, I would add one more, after “her head” and thus incorporate “And died” into the stream. It’s a good end to the sequence and allows your readers to release the breath they have been taking in and holding. I figure that the reader takes in a little more air and gets a little tenser with each ellipsis and lets it out while flopping back on the period. If this was video I would expect a jump of camera POV or in-out zoom with each ellipsis. Whole sequence takes 2? 3? seconds. Exact opposite here. I feel the passage is too elliptical but I like the final paragraph break. It works as punctuation. implies that Bob has stopped in his tracks to puzzle something out. Your example has things swinging and thumping and slamming and leaping, and that clashes with the slow transition that an ellipses puts in mind. I’d recast the paragraph with em-dashes. I tend to overuse transitional punctuation, myself. A lot of my self-editing involves going back over what I just wrote and breaking up sentences into shorter ones, or else recasting them with a comma and a conjunction. I scatter semicolons like confetti. *Accurately*, but far too prolifically. I blame an adolescence spent reading Mercedes Lackey. I grew up reading a few old school authors who were perhaps overly fond of semicolons. It rubbed off. There’s nothing wrong with using semi-colons; they’re a great way to keep closely-related statements joined yet demarcated. I only use semicolons for winking. In Classical Greek, a semi-colon is the question mark. Yes. In my day job I get dinged for them and have to re-write, as the type of sentences that use semicolons correctly frequently read above the preferred eighth grade level. It’s not a bad exercise, actually. Why do I suddenly feel the urge to geek out about e e cummings? And Don Marquis with Archie and Mehitabel. no capitalization – poor archie. I liked Archie s habit of missing the apostrophe, since he couldn’t hit more than one key at a time. I enjoyed reading those works, in no small part due to their idiosyncratic style of (non)punctuation. The idea of archie diving headfirst onto the typewriter to painstakingly write one letter at a time always made me laugh. At the same time, it seemed an apt metaphor for the pain of composition. I think of archie on those days when I don’t feel like writing, and it seems a whole lot easier. You let the curious punctuation, spacing, and kerning hide much from you. For instance, he wrote a lot of sonnets. My writing/reading brain is hypersensitive to the pacing cues provided by punctuation. Pet peeve: ellipses used where an m-dash is called for. Ellipses indicate trailing off, slowing down, petering out..
M-dash indicates interruption or abrupt halt, and is better suited to simultaneity. Semicolon makes the phrase stop at a cliffhanger that jumps to the next part; both more definite and unlike the full-stop of a period. The comma is generally a pause button (giving me a dislike of needlessly pause separated modifiers), tho the comma splice (curmudgeons use this, screw grammar) indicates tumbling from one phrase to the next. I credit a long ago article by Samuel Delany with twigging my brain to what it was seeing. Gasp! Give up my ellipses!!!! They’ll get mine when they pry them out of my cold, dead hands! I take this opportunity to mention an expensive book. Quite a lot of University libraries have it. If your local library does Inter Library Loan (and most do) they can get it for you for at most, the cost of postage (book rate). And you may’ve already paid for it with your taxes, so no extra charge will be incurred. I look at it this way – language is different from living. So we really don’t write as we live (or as our characters do). Except for a few “experimental” writers – that are, in my opinion, mostly unreadable. My question is, where to put, the comma? Just spit-balling here, but I’m saying “right OUT”. I would replace the first one with an em-dash, myself. Then suffer a nightmare tonight of being back in my high school English class. Master’s degree from Vassar – when that meant something. She mentioned a couple of times being the same class as (to later become) Admiral Hopper. I read somewhere that commas are the “salt and pepper” of writing. There are places where they should be used, and places where people season to taste. I over-comma. It works for dialog because I put them in where one pauses when speaking. It is not, however, grammatical, but, if it sounds right, is it really a problem, or, perhaps, just quirky? Wow, that got ugly, fast. Re: Project Dystopia, do reviews really mean anything on book 8 (or 40-something Wine of the Gods)? I’m happy to leave one, but it seems rather pointless. “I read book 7, but there are no reviews for book 8; I guess I’ll skip that one,” doesn’t seem like something anyone would do. I really like what you’re doing with the prophets (The Prophets?). I suppose that might be a teaser in a late-in-series review. I’ll take any review I can get. But when the reviews drop off sharp with subsequent books it give the impression the the series has problems. 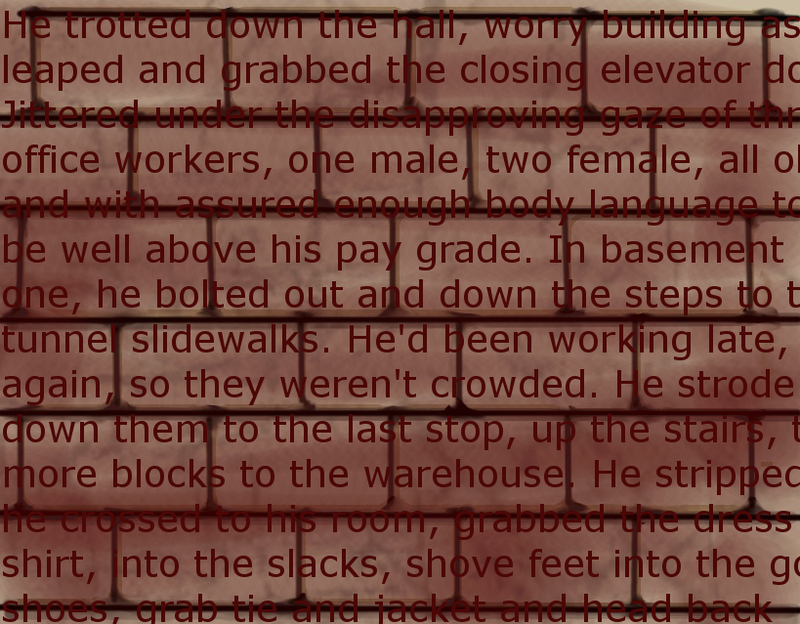 I remember early on getting fussed at for using justified spacing, because it ‘makes rivers thru the text’. I assume others have more context for your selection above. 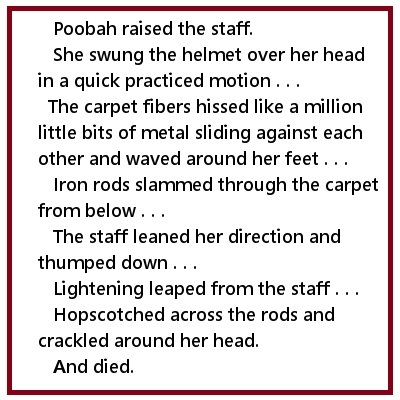 It took me three readings to decide that Poobah and “she” weren’t the same character. Then I understood what was going on and joined the dash, as in -dash vs ellipsis- crew. And I would have -the word lightning to the word died- in one paragraph together. Or maybe just two sentences. But when I had worked my way thru all this I liked the image. A lot. Well, a tiny smidge in the middle of a work in progress. I ought to have put in the character’s name instead of “she” and it would have been more clear. Better, but not what it should be. Despite the recent snows, it might be Spring asserting itself and some allergy with it. And of course the effective decongestant is now a pain to acquire. Wasn’t it James Thurber who complained that the New Yorker was in a commatose condition? I don’t know; I was making reference to a different instance of rather severe comma abuse.